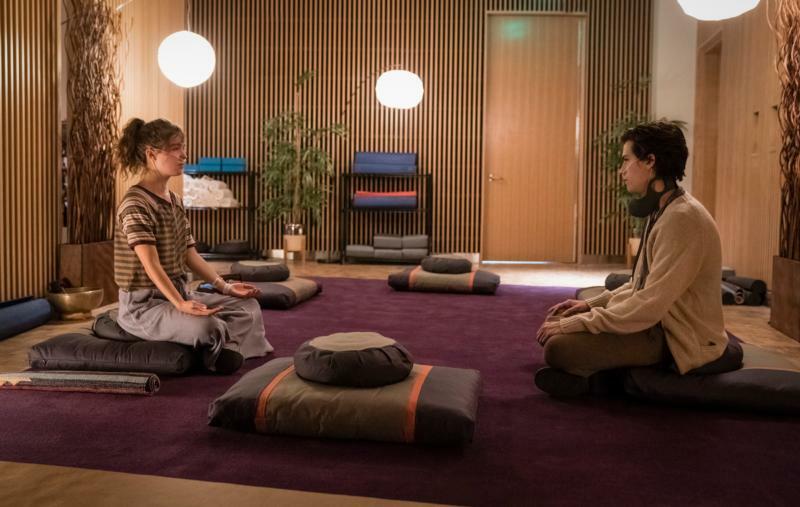 NEW YORK (CNS) — “Five Feet Apart” (Lionsgate), a generally engaging young-adult romantic drama about the redeeming power of sacrificial love, is aimed, with the precision of a heat-seeking missile, at 17-year-old girls. While mature themes, including sexuality, preclude endorsement for most adolescents, parents may consider the positive values underlying the story sufficient reason to waver in the case of older, well-grounded teens. Director Justin Baldoni and screenwriters Mikki Daughtry and Tobias Iaconis take on mortality from cystic fibrosis, a subject that could easily have led them into tasteless mawkishness. Instead, they’ve treated their material in a way that’s compassionate, medically correct and, for the most part, morally sound. The film somewhat resembles 2014’s “The Fault in Our Stars,” about a pair of cancer-afflicted young adults. But here there’s the additional peril of bacterial infection. Stella and Will (Cole Sprouse) are both patients participating in a clinical trial of innovative medications. Both know, however, that their disease will eventually kill them. Stella, who is hopeful of receiving a lung transplant that would extend her life by at least five years, is orderly and precise about her treatment regimen, and doesn’t understand why Will lacks similar discipline. She also maintains a blog to monitor her progress and has some interest in the possibility of an afterlife — though in a way that’s more broadly spiritual than specifically religious. In keeping with the rom-com formula, they find a way to “date” within the hospital, and their affection for each other grows. But there’s one awful caveat: No touching, and definitely no kissing since sharing bacteria would be almost instantly fatal. Among the many indignities inflicted on cystic fibrosis patients is the requirement to remain at least 6 feet apart from each other. Stella figures out, however, that she can cheat this distance a little by using a five-foot-long pool cue. By holding on to either end of the cue, she and Will can create a passable illusion of hand-holding intimacy. Overseeing their care is gruffly maternal nurse Barb (Kimberly Hebert Gregory), and the pair have a shared friend in wisecracking, gay fellow patient Poe (Moises Arias). Stella has a couple of tragic secrets; Will, a talented artist, proves eager to be under her moral tutelage; and the parents of both, as is de rigeur in young-adult fare, appear only briefly as supporting players. Thus the would-be lovers have to work out their issues for themselves. Are they living just for their treatment, for instance, or accepting their treatment as a way to embrace life? The film contains references to homosexuality, a single instance of rough language and fleeting crude talk. The Catholic News Service classification is A-III — adults. The Motion Picture Association of America rating is PG-13 — parents strongly cautioned. Some material may be inappropriate for children under 13.